The information contained on this page (and associated links) are considered the official participant guide for the Zumbro 50 Mile Endurance Run. Runners at a minimum should familiarize themselves with all of this information prior to registering for the race and then again prior to running race as we will update this page up until a 10 days or so before the race. Runners should share this information with any crews or spectators that they plan on having join them at the race. the Zumbro Endurance Run was established in 2009, 100% trail Race & Minimum Maintenance Gravel Roads, Race location is 1:45 south of the MSP International Apirport, 50 Miles (3 x 16.7 mile loops), Elevation Gain 9,294 FT, Elevation Loss 9,294 FT, NET Elevation Change 18,588 FT, 15 Aid Stations, 18 hour time limit. A well marked course with plenty of aid and tons of friendly, experienced volunteers. 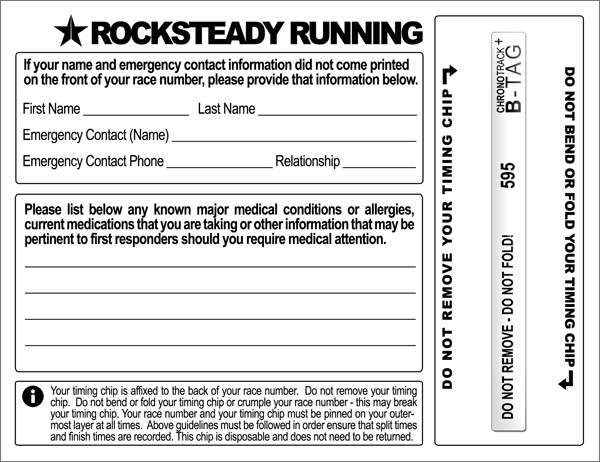 Runners who register by March 13th will have their name custom printed on their race bib. All finishers will receive a wood finishers medal. All registered runners that show up on race day get an awesome Rocksteady Running Tri-Blend (read; non-technical / casual cotton blend) T-Shirt with a super cool design, Shirts are unisex but fit both genders really well – you can see the current and past years race shirts HERE. Friday April 12th, 10:00 PM to 11:30 PM – West Assembly Area – We will do a quick race-briefing at 11:55 PM / 5 minutes prior to the race-start. Please keep your drop bags as small as possible. We will accept drop-bags at the start on Friday night and they must be delivered to us by 11:30 PM. Each drop bag must be clearly labeled with the race distance, runner’s name, race number, and the drop bag’s destination / aid station name (Aid Station 1/4 – Bridge, Aid Station 2/3 – Sand Coulee, Aid Station 5 – Start / Finish). Race numbers will be assigned a few days before the race start and will be available on the website. Your drop bag may not be available at Aid Station 1 or 2 on your first loop as they come fairly quickly and we need time to get the drop bas out to their destination. Please do not put valuables or liquids (cans of pop, Red Bull, etc.) into drop bags. Runners may also return to their vehicle in the West Assembly area after each 17 mile loop, essentially using their vehicles as a “drop bag” – please be sure to cross over the timing mat either before or after you head to your vehicle, but not both / two times (only cross the timing mat once). Drop bags will not be returned to the finish area until the end of the race (6:00 PM Saturday) so we ask that you only put items in your bags that you are happy living without should you need to leave before drop bags are back. Items left behind will not be mailed to participants and will be dontated to charity. The Midnight 50 starts at Midnight, thus you will need a good headlamp and or flashlight. Zumbro River Bottoms / Management Area – West Assembly, Saturday April 13th, 12:01 AM (Late Friday night / Early Saturday morning) . All runners must check-in no later than 11:30 PM – if you fail to do so, you are not officially in the race – this is your responsibility. We will do a quick pre-race briefing at 11:55 PM / 5 minutes prior to the race start. Because the 50 mile race is not the only race happening during race weekend (100 mile starts at 8:00AM Friday and 17 mile starts at 9:00AM Saturday) we have often thought about implementing a “back bib” / race number for 50 mile runners, rather than do that now and make it mandatory we came up with the idea of a piece of blue ribbon. You are welcome to take the piece of pink ribbon and tie it to the back of your hydration pack, waist belt etc. so you can easily be identified by runners doing the other distances, hopefully you will get some cheers and passed with care by the fresher / more energetic runners in the 17 mile race. It is NOT mandatory that you participate in this but it is there as an option and works really well. *If you have special dietary requirements, please make sure to make use of your drop bags. We cannot guarentee that all of the above foods listed will be available at all times, if there is a nutrition item that could “make or break” your race, be sure to make use of your crew, drop bags or plan to carry what you need. There is no vehicular access for crews or spectators to aid station 1/4 (and thus 2/3). The Minimum Maintenance road leading to Aid Station 1/4 (Bridge) and Aid Station 2/3 (Sand Coulee) is narrow and in poor condition and not suitable for a large number of cars. If runners crews or spectators are found driving to the aid stations – their runner will disqualified. For crews, pacers or spectators who wish to meet their runner at these aid stations they may hike to meet you – we will mark some shortcuts (for crew members only – not runners) who wish to make this hike. Crew, family and spectators need to be sure to dress appropriately for hiking on sloppy trails, have a headlamp or flashlight and be sure to give the right of way to the runners when they are on the trail. Crew should be sure to study and print the course maps on the maps / data page of the website. Please note, that this may be a very strenuous hike for some people. We thank you for your understanding, these decision are made based on variable Spring road conditions, field size, for the safety of race crew, family members and friends of the runners and to save your vehicles and the road from damage. Pacers are not allowed in the 50 mile race. 50 mile runners are allowed to have their own support crews and have spectators come see them, however your crews may only give you aid at official race aid stations. The finish line cutoff for an official finish is 18 hours (Saturday, 6:00 pm). All cutoffs will be strictly enforced – we do however reserve the right to pull (or allow to continue) any racer as we see fit – if you are uncomfortable with those terms, consider running another race. You must make (mile 33.4) and have started your 3rd / final loop (left the aid station) by 12:45 PM on Saturday.